Our cat Nala has proven that she can be trusted to be let out in our fenced in back yard and not leave it. The only time she has broken that deal is when there were holes in the fence large enough for her to walk right out (but behind plants and so not readily visible to unsuspecting humans). We are so accustomed to letting her in and out - she paws at the back door to be let in - that we sometimes have to announce out loud that "I just let the cat in/out" or we forget her state (cue Schrödinger reference). The last couple of days have been such. Yesterday Reena told me as I was arriving home and she was departing that Nala was out. OK. When it was time for me to leave later, I called for her. Normally she comes bounding right in unless she is in stalk-mode on a mouse. I walked the entire back yard, which in November has few concealing areas. No sign of her. I closed the back door and made a walk-through of the house. No sign of her. Too bad, so sad, kitty, because it was about to rain (hard) and if she was out she was going to get wet. When I arrived home again later, there she was, in the house after all. Same thing happened today, but this time I have been home the entire time. Where the heck is she? I looked in all the usual inside places where she naps, and a few once upon a time places. Nope. Then I noticed that one of my bags of photo studio props was spilling out onto its temporary location on the guest bed. Then I remembered that a week earlier I had redirected Nala when she was trying to get into that very bag and kneading (and purring loudly) on the big piece of black tulle with purple glitter. Sure enough, there she was. 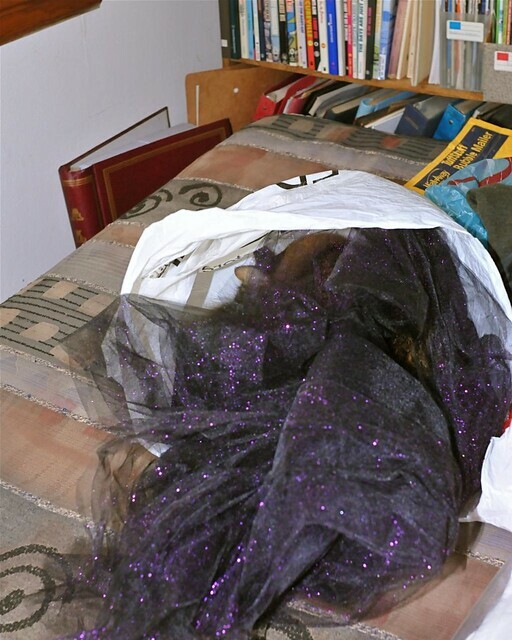 She had wormed her way into the plastic bag, dislodging the tulle, for her nap. My snapping a few pics made her ear flap but otherwise didn't disturb her. I have never had a female cat before, and her ongoing love affair with fabric and general girly-girl traits never fail to amuse me. Thanks for another hearty laugh, Nala! 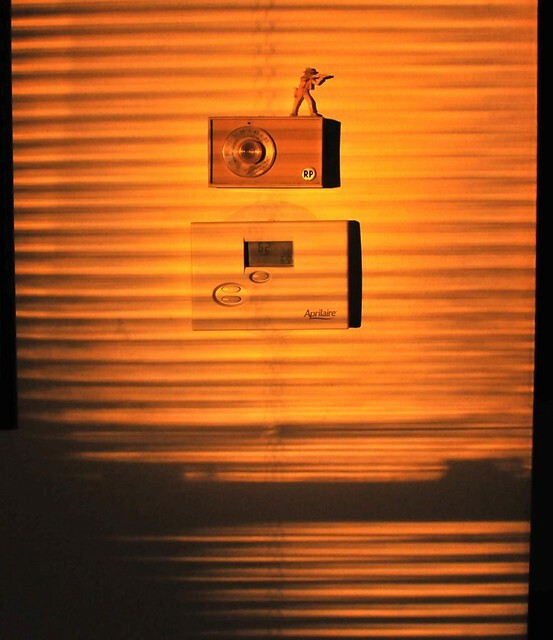 Oh, and as an aside, here was the sun coming in my living room window at sunrise this morning. Golden hour indeed! This lasted for about three minutes.